Incredibles 2 just opened in theaters last Friday so it made sense to celebrate with some of our favorite superheroes this week. We started the week as we do every week, assigning different superheroes to our campers and having them come up with a team name and decorate a team poster showing off their superheroes. Our first team of the week, honoring Incredibles 2, came up with the name Incred 2. We might have wanted to give them more time to think on that one but it’s all in good fun, so we continued our introductions: Wonder Woman’s team came up with Wonder League, Black Panther became the Cotton Candy Panthers, our team for Black Widow (we hear her own movie is arriving in theaters next year!) came up with Kung Fu Cooks, and our last team with the Hulks decided to name themselves the Big Green Cucumbers. Not everyone has gotten a chance to see the Incredibles 2 yet, so we didn’t give any spoilers but when we think of the Incredibles family, we think of your typical American family – with some hidden superpowers! 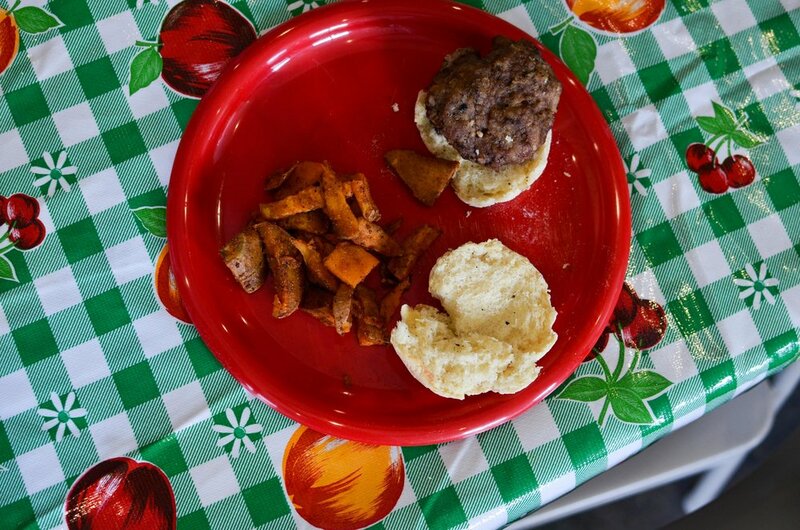 We decided to play into that, so we mixed, shaped, and grilled our own hamburgers, baked some dinner rolls for buns, and baked sweet potato fries for the side. Our recipe for the hamburgers included evaporated milk, Worcester sauce, and eggs – some things I had never put in a hamburger before, but which made it even more delicious – hidden superpowers! Before we got into cooking though, we tested our taste buds with Tasting Stations which got us thinking about the different cultures and traditions found in the United States. We got to try wasabi peas, matzo balls, and guava juice. It was interesting how many campers said the matzo balls tasted meaty but it’s really just egg, flour, water, and oil. Cooking stations went smoothly, and campers enjoyed working around the grill outside, but it was hot that day, so games were done inside. Most of the campers went to play a couple rounds of Family Road Trip where the first camper starts by saying what they are bringing on the family road trip. The next person repeats the person before them and adds an item. The next person repeats the last two items and add theirs, and it continues around the circle. A good memory game! The Incred 2 team in the meantime had the special job of clearing stations and plating our meal before we all sat down to enjoy it. On Tuesday we got to know Wonder Woman! Wonder Woman hails from the island nation of Themyscira so we decided to honor her with Greek food. For our day’s craft, the campers learned how to make arm bracelets like the ones worn by Wonder Woman. Wonder Woman is gifted with accelerated healing power, so we talked about the fruits and vegetables that can give us those powers too. Each camper put their favorites on their bracelets. Next, we jumped into Snack Wars! 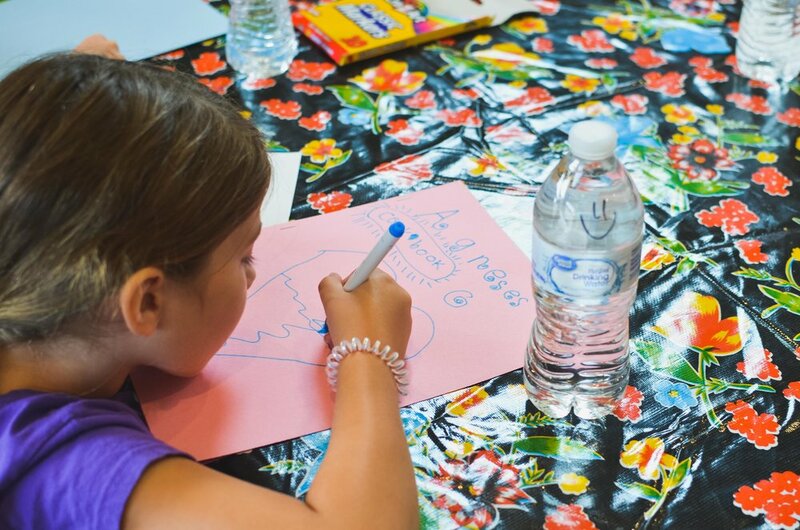 Each pair of campers were given some banana, wasabi peas, apple butter, pretzels, and the goal of creating their own superhero. We got some really interesting ones including one that gained strength from hugs and hailed from Cleveland, Ohio. Not all were so sweet though! One ate his enemies. We didn’t dwell on that too much though and we transitioned into Cooking Stations. Today we baked Spanakopita and made Skewer-less Chicken Kebabs! Everything turned out great and the Wonder League did a great job of setting our places while the rest of the campers played Heroes and Villains outside. We all met back up inside after some time to try what we all worked so hard at and I heard a lot of people say this was their favorite day! On Wednesday, Black Panther stopped by SoFAB for a visit! In the morning, the campers learned about some of the African traditions connected to Black Panther by painting plates with designs inspired by traditional African prints. The campers noticed how the patterns were formed from lines, dots, and different shapes repeated in complex arrangements. As the plates were drying, the campers moved on to a rousing game of Jeopardy! with categories stemming from themes seen in Black Panther. According to the comic, the country of Wakanda is located between Ethiopia, Kenya, and South Sudan. The Jeopardy! categories for the day were Ethiopian Cuisine, Ethiopian Culture, Kenyan Cuisine, and Food Technology. Although it was a close match, The Big Green Cucumbers emerged victorious. The campers then moved into cooking stations, making traditional Ethiopian food including a bread called injera, a vegetarian dish called atakilta wat, and a spicy chicken dish called kik alicha wat. These dishes required lots of chopping, dicing, simmering, and sautéing! When all of the cooking was finished, the campers headed outside for a game of refrigerator tag while the Cotton Candy Panthers stayed inside to plate the food. The campers really enjoyed the injera and the spicy chicken, and Black Panther day was a lot of fun! On Thursday, Black Widow crept into the museum as we celebrated the traditions and customs of Russia, her homeland. In the morning, the campers learned about the tradition of dying Easter Eggs using the coloring from red onion peels. 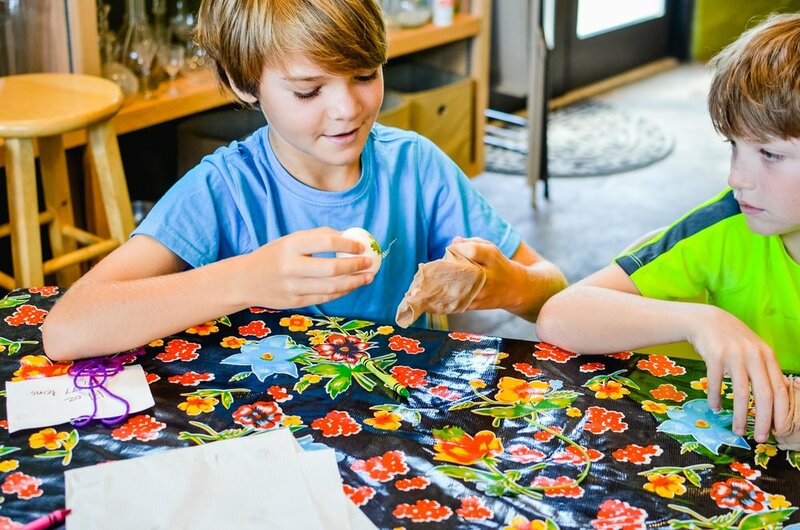 The kids worked to decorate eggs with herbs and wax designs before hardboiling them in the natural dye. Next came a lesson on food preservatives present in large quantities in many processed foods. 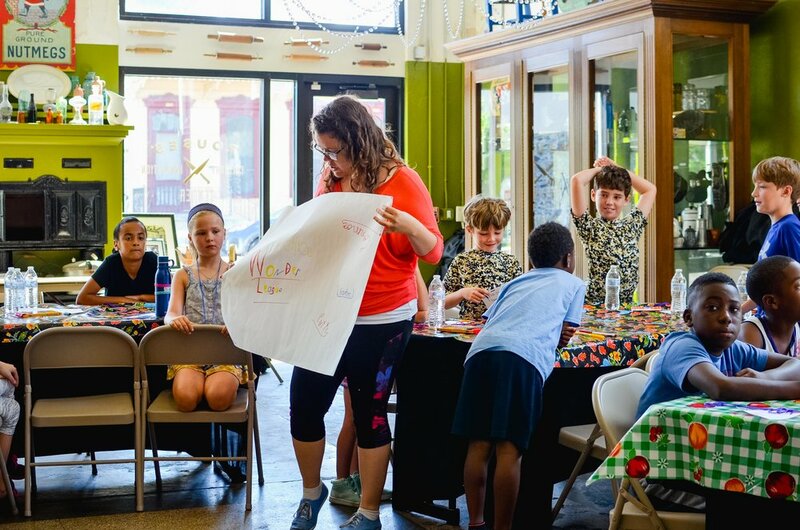 Campers played a round of Food Preservative Bingo to introduce them to some of the chemicals used and encourage them to read labels before buying heavily processed food products. Next, it was time to move into the cooking stations where campers worked to make beef stroganoff, a dish originating in Russia, as well as a traditional Russian tea snack called sushki. The stroganoff was loaded with lots of fresh mushrooms and tender beef, a first for many campers. They also enjoyed forming the sushki dough with a mixer and shaping the dough into bite-sized rings. 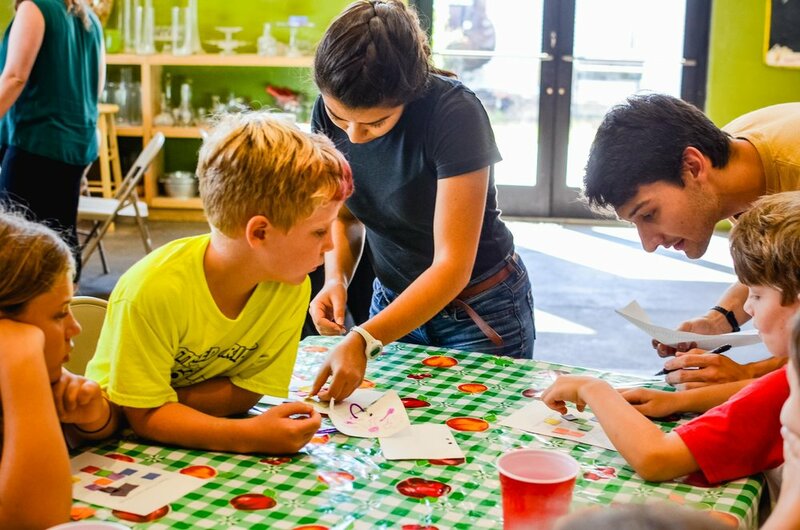 After cooking, the campers headed across the museum to play a new game called Spider Bite where a secret “doctor” tries to stop the spread of the “virus.” In the kitchen, the Kung-Fu Cooks worked hard to serve the stroganoff and sushki. The food was delicious, Black Widow approved, and the campers were inspired to try new foods at home. On Friday, all the campers were turning GREEN as we celebrated the Hulk! First, the campers reflected on the entire week of recipes by decorating custom camp cookbooks. They made sure to note any changes they would make to the recipes and had new friends sign their books. Next, the campers played a new game in which they explored the relationship between food and class in America. They were tasked with designing a meal for their table based on certain limitations such as time available to cook and price of each item. Ultimately, the game showed them how fresh food can be both expensive and time consuming, as well as how cheaper, more processed foods often have excess calories which are hard to control. After this game, the campers moved into the cooking stations to make foods that were-you guessed it-GREEN! On the menu for the day was a green curry and a key lime pie. 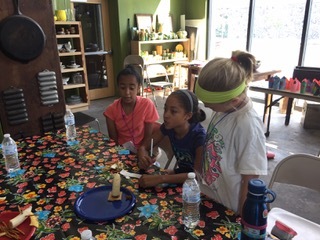 The green curry had lots of basil, cilantro, lime, and bell pepper, making it fresh and flavorful, For the key lime pie, the campers enjoyed zesting and juicing the limes as well as making a delicious graham cracker crust. 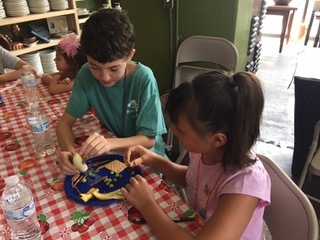 While the curry was simmering, the campers headed outside for a game of Chefs and Waiters while the Big Green Cucumbers stayed inside to help with plating. The curry turned out perfectly spicy and fresh, and the key lime pie was the perfect cool treat after a long day. It was a Hulk-smashing success!